Who are the “faces” of their respective sports? For most sports, the answer is obvious. In the NBA, it’s Lebron. The NFL has Tom Brady. Sidney Crosby, as much as I dislike him, is the face of the NHL. Golf is still dominated by the specter of the injured Tiger Woods, despite the rise of young stars like Rory, DJ, and Fowler. But who is the “face” of baseball? Is it Mike Trout? Kris Bryant? One of the other young superstars? The answer isn’t that clear. The “Face” of Baseball? Mike Trout has the winning smile and the stats to boot. I bring this up in response to Jayson Stark’s article on ESPN today regarding this very topic. He emphasizes a survey conducted by Luker on Trends investigating America’s favorite professional athletes, where no active baseball players made the top 50. Stark concludes that MLB has a marketing problem; they need to start marketing their stars, using similar strategies to the other American sports leagues. Baseball needs stars, that much is true–every sport does. But baseball is a different sport, played in a different manner than hockey or basketball, and should be marketed differently as a result. First, I want to point out a flaw in the survey. The Luker on Trends poll was conducted between November 2016 and February 2017, right in the heart of baseball’s offseason. While teams were making moves on the hot stove — news that most casual baseball fans don’t follow too closely — the NBA and NHL were in the heart of their regular seasons, and the NFL put on one of the greatest Superbowls ever. Recency bias played a role in that survey, though the observation that baseball does not have a “face” is valid. I’ve consistently referred to baseball as America’s greatest democratic tradition. That’s the key difference between it and other popular American sports. With five seconds to go in an Cavs game, who’s getting the ball? Lebron James. With a minute to play in a Patriots game, who has the ball? Tom Brady. In the bottom of the ninth with 2 outs, who has the bat in their hand? Whoever’s turn it is in the lineup. It could be Mike Trout; it could be C.J. Cron. Baseball is a game where on any given day, anyone can be a hero. Take last night’s Cubs-Cardinals game. On a squad loaded with superstars like Anthony Rizzo and Kris Bryant, who was the hero? Albert Almora, Jr, who robbed Matt Adams of a home run to preserve a one-run lead for the Cubbies. Or take last night’s game between the Dodgers and the Padres. On Opening Day, the Dodgers rolled over the Padres 14-3 behind a potent offense. 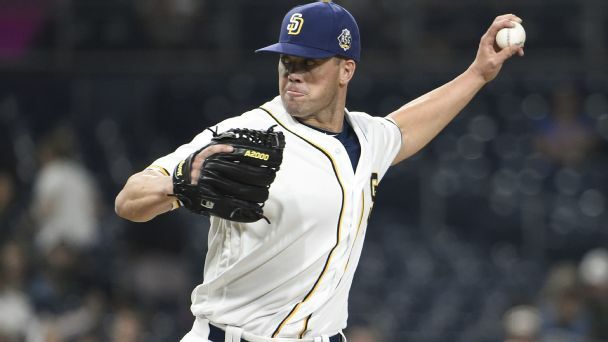 Last night, though, that offense was held in check by that famous pitcher known the world over…Clayton Richard. For that night, he was the star. In today’s game, it’ll be someone different. Clayton Richard, the “Face” of Baseball? On Tuesday night, he was. My point here is that baseball’s marketing should match the product on the field. I’m not saying we should put Clayton Richard on a Wheaties box anytime soon, but rather that MLB shouldn’t try to put one single star on a pedestal in a sport that’s rife with potential heroes. Let me give you an example. Suppose Mike Trout — one of the contenders for the “face of baseball” award — has a terrible game. He goes 0-4 with 4 strikeouts, even blunders a play in centerfield. Would we care? We might notice, we might comment on it. But it probably won’t make headlines until it becomes a recurrent trend. Now, if Lebron James gets held scoreless in a game — or, God forbid, takes a night off — suddenly everyone is up in arms. Baseball as a sport is less reliant on its stars day-in and day-out than basketball. Every sport needs stars. We all go to the ballpark wanting to see feats of greatness, and players like Mike Trout, Kris Bryant, and Noah Syndergaard give us a better chance to witness something amazing than the average player. But a sport like baseball doesn’t need a “face,” a singular star. To elevate one player above the rest in marketing strategies ruins what is so exciting about baseball right now: the unprecedented youth movement taking over the game. How do we decide between Kris Bryant, Mike Trout, and Noah Syndergaard? The easy answer is that we don’t have to. More importantly, picking one star to be the “face,” the first among equals, betrays the heart of the sport. If baseball is truly America’s greatest democratic tradition, let’s have it be led by the many rather than the few.